Bangalore is a beautiful city that is filled with ideas and an environment that is loved by all. This city is one of the most loved cities in the country for all that it offers, which includes its real estate. Mantri Manyata Lithos is a new residential project by Mantri Developers that offers supreme luxury and comfort to meet the needs of every individual of your family. Spread over 10 acres of luscious land, with 4 acres being converted into a Green Zone, this development contains distinct R.C.C structures that offer outstanding variants of 2BHK, 3BHK apartments and penthouses that are simply irresistible. The apartment and penthouse areas start at 1355 sq. ft. and go up to an amazing 3220 sq. ft., providing luxury space that you will never run short of. 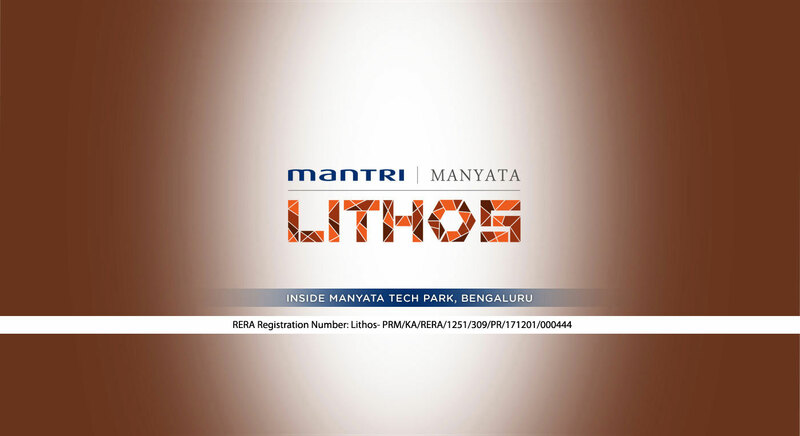 Mantri Manyata Lithos Bangalore is magnificent residential development that is packed with every element of luxury that it can find. With high-end internal and external amenities, this development leaves no room for errors and only offers the best. The apartments are designed to perfection and contain branded furnishings and fittings, vitrified flooring, wooden laminated flooring in the master bedroom, premium doors, wooden door fame of 7 ft., high-quality windows with MS grills, sophisticated kitchens, safety features and more. The external amenities will give you a rush of excitement each and every day. The external amenities include a meditation centre, gymnasium, clubhouse, multiple sports facilities and a play-area for kids, intercom facility, day care centre, 24hour water supply, ATM, beautiful open space, landscape garden, swift lifts, power back-up for emergencies, efficient car parking and security with video surveillance. This development also takes-up rain water harvesting and sewage treatment. 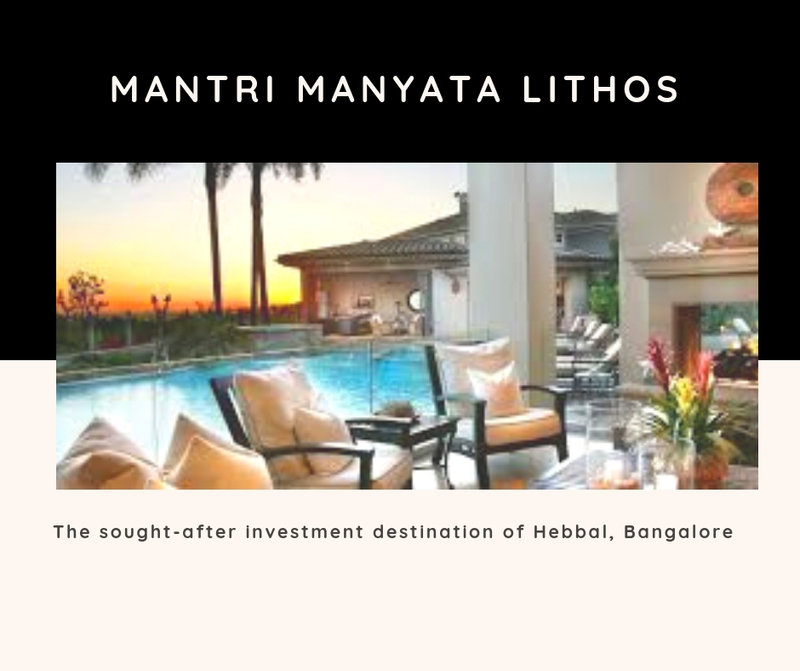 Mantri Manyata Lithos Hebbal comes in close proximity to plenty of places that include schools, universities, malls, shopping centres, cinemas, cafes, restaurants, supermarkets, convenience stores, ATMs, banks, hospitals, medical centres, public transport, etc. Experience conveniences like never before and say ‘goodbye’ to long-distance journeys. The Mantri Manyata Lithos Price is affordable and totally worth your savings. A new home to live a modern-day lifestyle, or even an investment for that matter, whatever the reason, this is the ultimate place to be. There are different payment plans that you can choose from according to your convenience and you can also avail easy home loans. Book an apartment at this development and live your dream! Mantri Developers Pvt. Ltd is one of South India ’s top real estate company that has reached dizzying heights, in not only India but also at an international level. Founded by Mr. Sushil Mantri in 1999 the company has reached the top position with innovative technology customer focus high technology engineering and uncompromising quality standards in construction& execution.Their projects include hospitality ,residential, commercial and education sectors.Their residential projects have on offer villas, ultra- luxury apartments, and budget apartments. Their construction is known for hi-tech homes such as home automation systems. The Mantri Square in Bengaluru is one of South India’s largest malls with an upscale bowling alley, plush movie theatres and popular food courts. They are partnering with DSK to build Mantri DSK Pinnacle, which is South India's tallest residential tower in Bangalore. Mantri Developers has International presence in Dubai, Singapore and the USA. This customer-centric company has won many awards such as the Top Ten Builders of India Award. The CII-ITC Sustainability Award 2012 was presented by the President of India, Shri. Pranab Mukherjee. The company has won over thousands of satisfied customers with timely deliveries and professional excellence. Another popular project with increasing demand is Mantri Energia, a premium residential apartment project themed around nature. A beautiful metal fabricated energy tree, glow-in-the-dark chess floor and a scenic rainforest like garden will entice the residents of all ages. Spread across 11 acres, the project also has alluring amenities like a plush clubhouse, various sports facilities, and leisure facilities like steam & sauna rooms. Surrounded with landscaped gardens, this project has environment friendly features like a self-irrigating planter system and an open office which is solar powered. Earthquake resistance – Seismic zone II compliant RCC framed structure. Foyer, Living, Dining, Family Room, Kitchen and bedrooms- Vitrified tile flooring. Master Bed Room –Laminated Wooden flooring. Good quality CP fittings of Jaquar or equivalent. 7 feet high engineered wood door frame. MS grill will be provided for windows of Ground Floor apartment's utility. Provision for electrical & plumbing points for modular kitchen. Located at Manyata Tech Park, Hebbal, Bangalore. Mere 8 kms from M G Road and CBD areas. 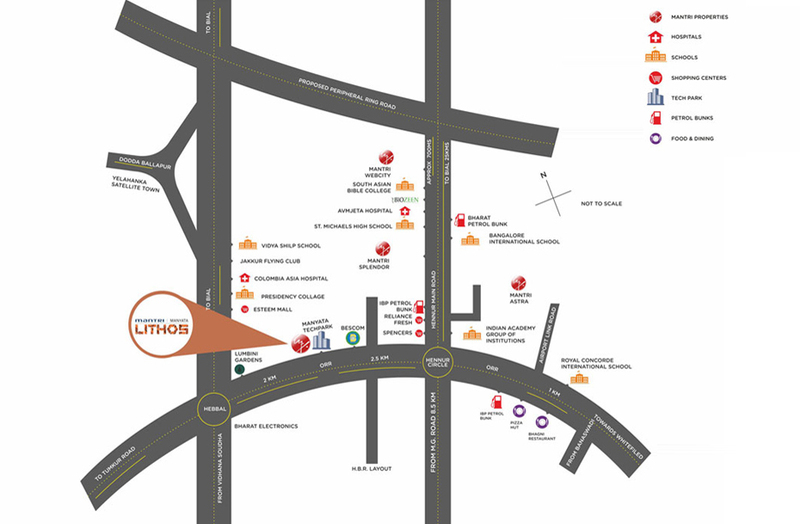 Columbia Asia Hospital within 3 kms. Well connected to city’s business districts, educational institutions and shopping areas.